SANTA ROSA, Calif. (KGO) -- The strongest storm of the season so far has arrived in the Bay Area. 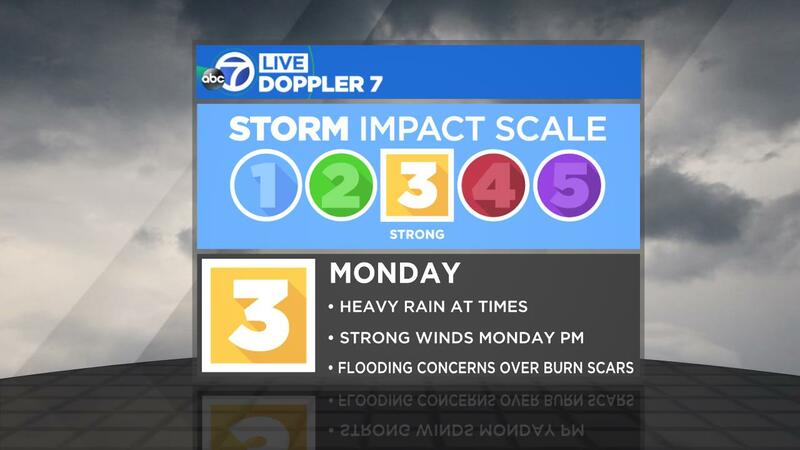 The storm ranks a 3 on our Storm Impact Scale and will bring heavy rain at times, strong winds and flooding concerns for parts of the North Bay. Heavier rain begins to arrive midday. Actions winds down as we approach Midnight. Over our recent burn scars Monday Evening. Possibility of mudslides/debris flows/flash flooding. Strongest winds likely Monday evening between 5pm - 10pm with frequent gusts over 30mph.